Reshape the future of emergency warning lights with the M9V2, a new generation of versatile, compact lightheads that implement Whelen’s Super-LED® technology and act as all-in-one warning/scene light. 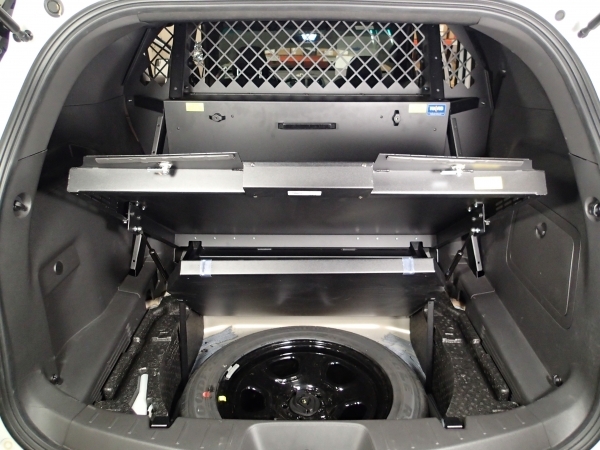 And because you do not have to pre-drill any holes in the rack, fleet managers will appreciate the well thought-out design of this rack for functionality, ease of up-grade and/or transfer from vehicle to vehicle. 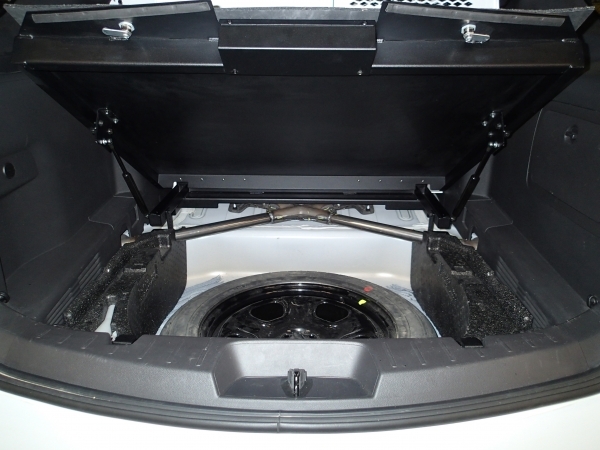 Advanced design with three vehicle specific models to ensure a perfect fit to your truck. 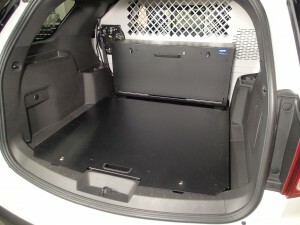 • Slim design takes up minimal bed cargo space. • Super heavy-duty steel construction with rugged heavy-duty 11 gauge steel tubular framing guarantee strength and reliability. • Impervious to weather extremes. 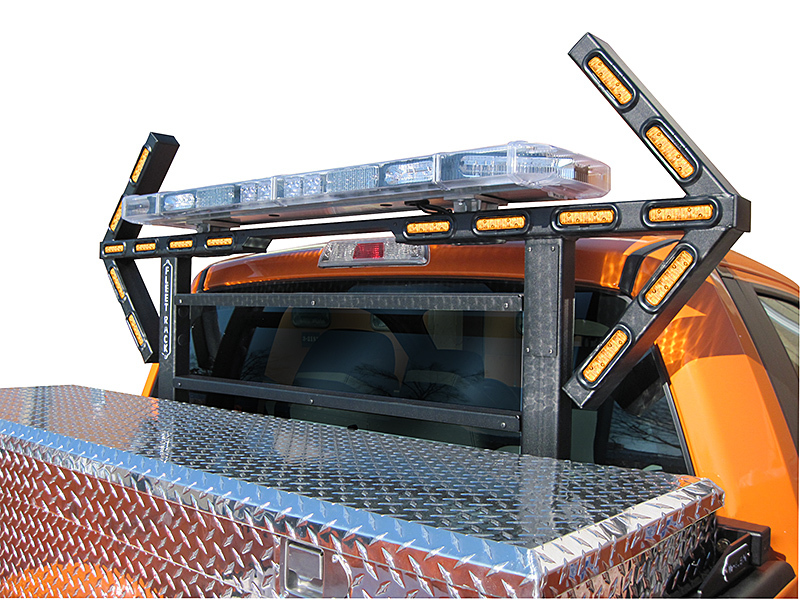 • Heavy-duty bolt-on system securely mounts to the bedrail of the pickup body without drilling ensuring a better resale value for your truck. 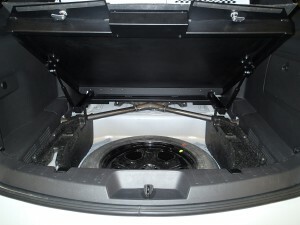 • Because of the bolt on system, it moves easily from vehicle to vehicle. • Pem® nuts, internally threaded fasteners, lock mounting screws securely and simply. • Mounts a variety of emergency lighting including full size or mini lightbars, beacons, auxiliary lighting and flood or spot lights. All lighting purchased separately. • TA frame design incorporates a factory installed, integrated 16-Lamp ION™ Super-LED® Traffic Advisor (left, right, split, and flash). • ION lightheads shrug off moisture, salt chemicals and road vibration. Smallest and most effective Super- LED light on the market. • Pre-drilled access holes accommodate a wide range of emergency lighting products from full size lightbars to single beacons. • Modular design allows you to easily add or change lighting as your warning needs change that is damage and trouble free. • Tubular design with wiring channels protect and cover wiring for security, weather protection, long-life serviceability and neat, professional appearance for your truck. • Built tough for the long haul, rust resistant, won’t bend or warp. • Models available for Chevrolet Silverado, and 2500; Ford Super- Duty, and Ford F150. • Optional heavy-duty screens and window guards protect the driver and passengers of the vehicle, while offering additional anchor points for securing cargo. • Window screen is designed not to block the visibility through the rearview window. 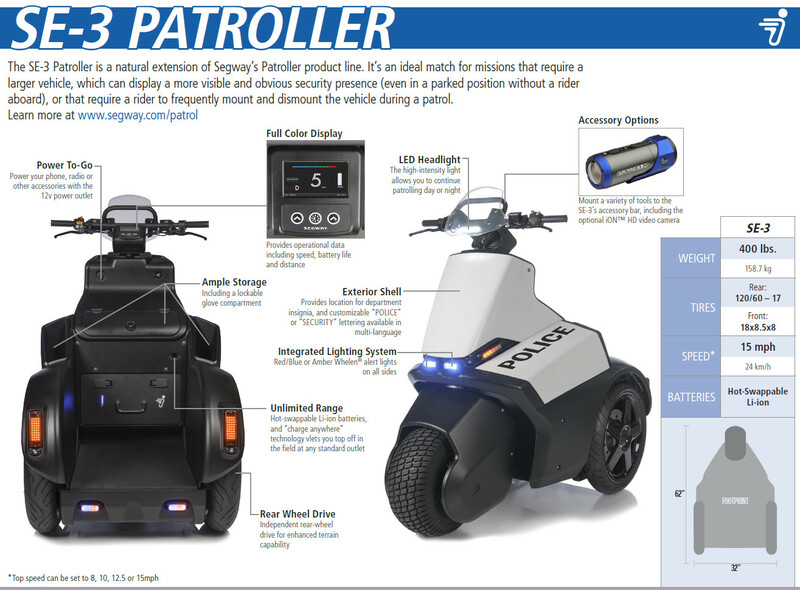 Segway is proud to announce our newest Patroller product, the Segway SE-3 Patroller. 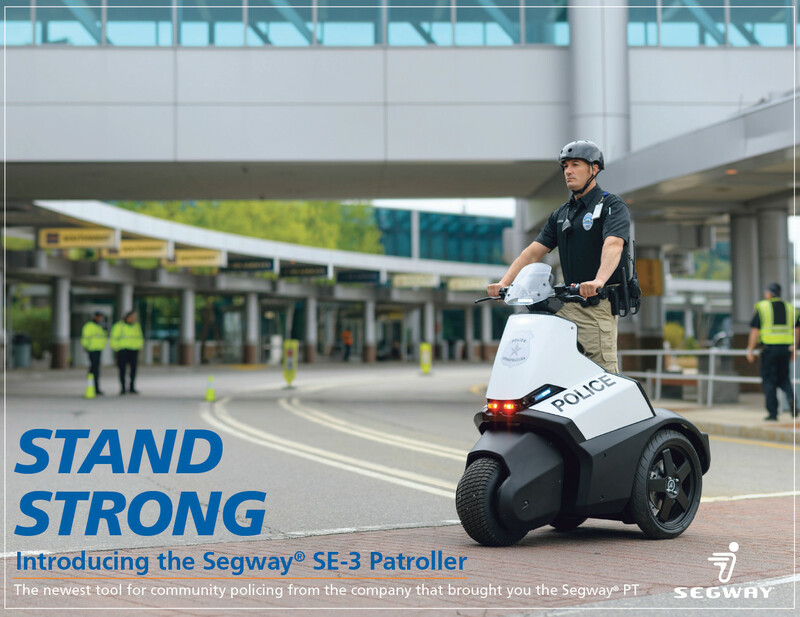 Join us for a short product overview webinar to learn about the SE-3’s features and benefits including its terrain capabilities, hot-swap and charge anywhere batteries and more.The SE-3 meets the specific needs of the public safety market. Click on the registration button below, attend the webinar and find out how. 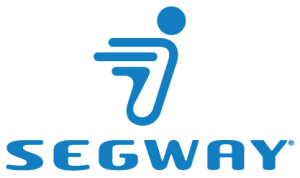 Works with some other mfg. rear partitions by removing or modifying forward filler panel. partition brackets may also need to be modified.